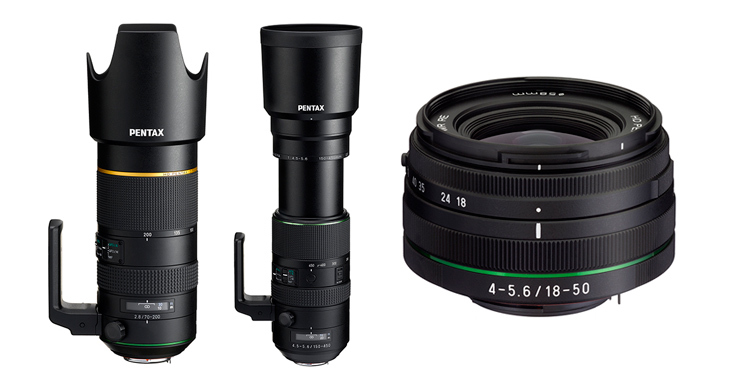 Covering a wide range of focal lengths, all three new Pentax zoom lenses feature HD coatings to improve image quality, as well as a Quick-Shift Focus System for better performance. Released under Pentax’s high performance ‘star’ series, the Japanese manufacturer is promising top grade image quality and edge-to-edge sharpness from the new 70-200mm f/2.8 telephoto zoom, thanks to the new optical construction and lens coatings. These include four Super-Low Dispersion Elements, two Extra-Low Dispersion (ED) elements and two Super ED elements for high contrast images with minimal chromatic aberrations throughout the zoom range. How that bears out remains to be seen as we rank the lens with our industry standard DxOMark Lens Metrics, but with newly developed Aero Bright Coating II, as well as multi-layer HD lens coatings, Pentax claim the new lens also effectively reduces ghosting and flare even under challenging backlit conditions. The fixed f/2.8 aperture through the zoom range is ideal for photographers looking to produce defocused backgrounds with portraits or achieve the fast shutter speeds required for top-end action photography. With an equivalent 107-307mm focal length when used on Pentax APS-C DSLRs such as the new Pentax K-S2, the new 70-200mm f/2.8 will certainly help you get closer to the action. With an image circle designed to cover a full frame 35mm sensor however, Pentax are also future proofing this lens to make it compatible with any future full frame K mount DLSRs without modification. The 70-200mm f/2.8 also features a new Quick-Shift focus system with three modes for quickly changing between auto and manual focus. QFS/A is an autofocus-priority mode, which allows the user to switch to manual-focusing operation when autofocus operation is complete. QFS/M is a manual-focus-priority mode, which enables the user to switch to manual focusing at any time and MF mode allows the user to instantly switch to manual focusing with a simple twist of the focus ring on the lens. Offering an equivalent 230-690mm focal length on Pentax APS-C cameras, the new 150-450mm offers incredible reach for sports, wildlife, aeroplane or motor sports photography. Obviously designed with the upcoming Pentax full frame DSLR in mind the new 150-450mm super zoom also produces a full 35mm image circle making it compatible with new Pentax cameras under development. For shooting outdoors the lens barrel is protected with 21 seals to prevent dust and water penetrating through and a SP (Super Protect) coating on the lens’s front element is designed to repel dust and dirt when shooting in difficult conditions. The new Pentax 150-450mm super zoom also offers a couple of handy autofocus features including the same Quick-Shift Focus from the new 70-200mm f/2.8 and four autofocus (AF) control buttons on the lens. The four AF buttons will only work with the lens attached the Pentax K-3 with the latest firmware installed, but offer easy access to autofocus with the camera in either a vertical or horizontal position. Two of the AF buttons can also be assigned additional functions such as Focus Preset or Autofocus Cancel to further enhance the performance credentials of this super telephoto zoom. There’s also Pentax’s DC autofocus motor for quick and quiet performance, a zoom lock to prevent lens creep and a detachable tripod mount including an ‘anti-falling’ mechanism. Launched alongside the new weather-resistant Pentax K-S2 DSLR the 18-50mm f/4-5.6DC WR RE also features 9 seals on the lens barrel to help keep out the elements and give photographers a completely weather proof shooting option. A standard zoom lens with an equivalent 27.5-76.5mm focal length, the new 18-50mm also claims to be the world’s shortest standard zoom offering a small, portable solution for Pentax DSLRs users who may be thinking of switching to a more convenient hybrid camera. The diminutive size is thanks to a new retractable lens mechanism, which means the lens only protrudes 41mm when in its stored position. The small size does have a bearing on optical construction however and the new Pentax 18-50mm only offers a variable maximum aperture of f/4-5.6, compared to many standard ‘kit lens’ zooms which will open up to f/3.5 at 18mm. In terms of other features there’s also the Pentax DC autofocus motor, SP & HD lens coatings and the Pentax Quick-Shift Focus System.